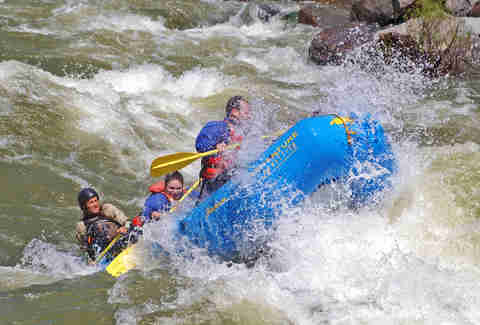 When learning to whitewater paddle, you are looking for consistency and predictability, not a full on “Deliverance” experience. The legendary Nantahala provides just the thing, since it’s dam-controlled, runs 350 days a year, and is adjacent to the Nantahala Outdoor Center, where over 100,000 paddlers (including 22 olympians) have taken classes in their 43 years of existence. 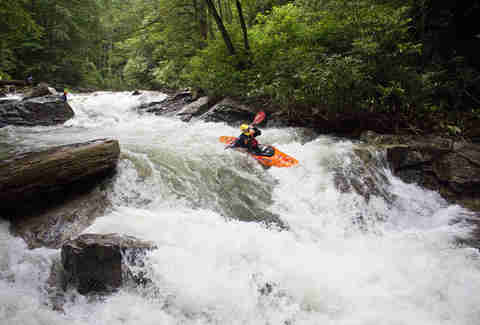 An eight-mile stretch features plenty of class II and III whitewater. Located in the Klamath Mountains, The Salmon’s a free-flower, unlike most dam controlled California Rivers. Appropriately, the clear waterway is filled with fish, from steelhead to rainbow trout to, well, salmon. And since it’s home to plenty of rapids, surrounded by miles and miles of pristine wildnerness areas, it’s a great place to learn. Take classes at Otter Bar Lodge Kayak School. 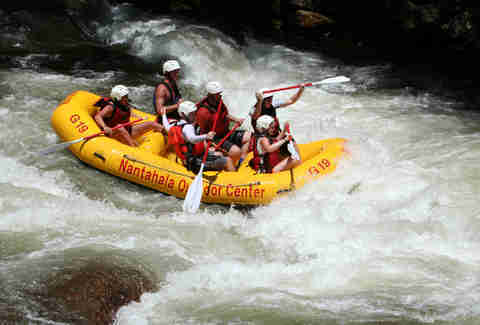 “It’s well-regarded, one of the best in the west,” says Nantahala instructor (and olympian paddler) Chris Hipgrave. The White Salmon is a 44-mile-long tributary of the Columbia River. Take lessons here if you find yourself with time in Portland in the summer; a few of the best rapids are just a short drive from the city. 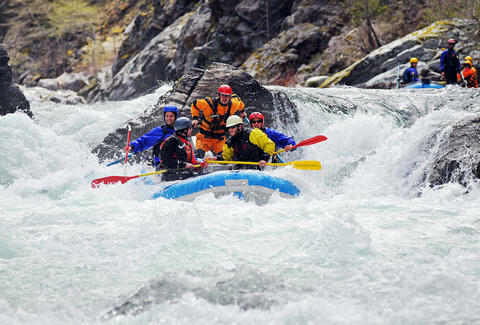 Wet Planet Whitewater is one of the biggest schools in the western US, and offers everything from two-hour pool sessions to multi-day classes on class one and two rapids on the White Salmon. Flowing through the Berkshires, the Deerfield features exotic whitewater passages but has a location that’s close to the major population centers of the Northeast. 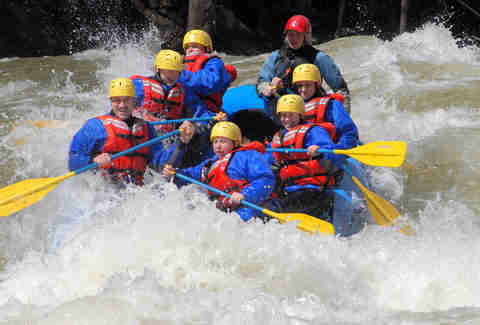 The extreme stuff is towards the river’s north; several hydroelectric dams break up the waterway; well-known outfitter Zoar Outdoor teaches classes and leads guided runs of the class one and two rapids to the south. 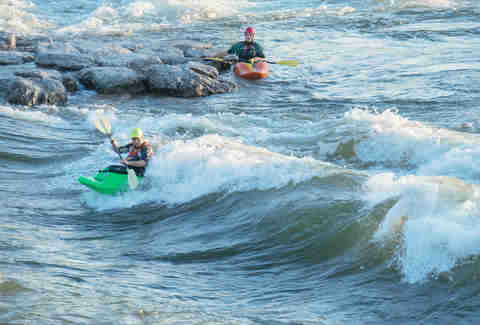 Missoula, Montana-based Kevin Colburn, American Whitewater’s National Stewardship Director, calls out this Western Pennsylvanian river as an ideal spot to learn to kayak in rapids. Colburn should know -- he’s paddled in nearly every state. “The middle is a class two, and the lower is a class three, so there’s a nice, natural progression,” he says. River Sport, in Confluence, PA, offers classes at several different levels -- including whitewater stand-up paddling classes. 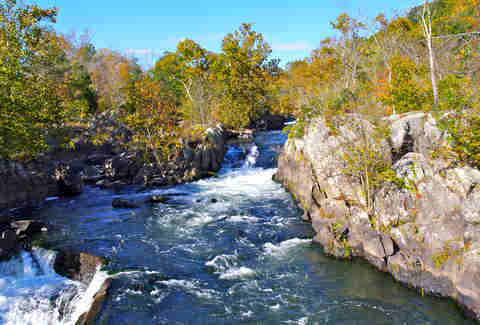 Not many folks think of the nation’s capital as an epicenter of whitewater kayaking, but they should. 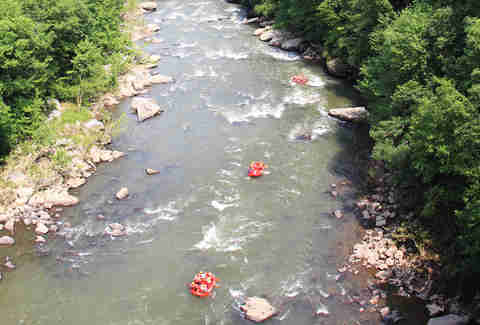 “It’s pretty incredible that there’s class one to five rapids, all within the beltway,” says Nantahala’s Chris Hipgrave. Learn from Potomac Paddlesports, an outfitter that can partner you with a master paddler, if even for a short weeknight class. American Whitewater’s Kevin Colburn calls this big and wide stretch of whitewater, located near Missoula, Montana, an ideal spot to start paddling. “It’s beautiful and safe spot to learn, for river running or freestyle paddling,” says Colburn. Best part? The glacial-fed river is isolated from roads and framed by dramatic cliffs. 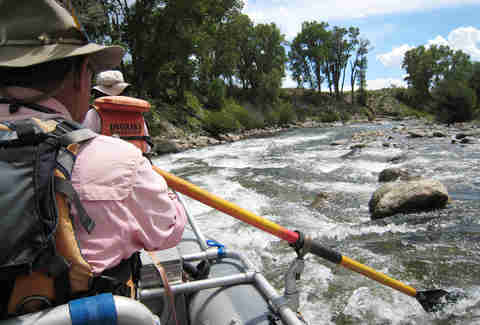 Contact outfitter 10,000 Waves, which is located near a campsite of the Lewis & Clark expedition. This stretch of warm blue water runs near the Great Smokies in Western North Carolina and features relatively mild rapids around granite domes; while paddling you’ll likely be able to spot herons, eagles, and kingfishers without risking a tip-over. Both Colburn and Hipgrave call this one of the best waterways in the east for beginners. 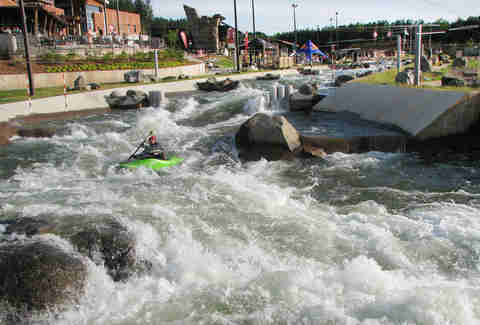 Now for something different: the NWC is a training facility that’s the largest manmade whitewater channel system in the world. U.S. Olympians train here, but total newbies can, too, since the flow is infinitely variable. Best part? after paddling hard you can post up at a water-view bar and sip from one (or several) of sixty craft brews on tap. In the course of its 150-mile run from Leadville to the plains, the Arkansas River takes in scenes of the some of the Colorado’s tallest peaks, located in the Sawatch Mountains. 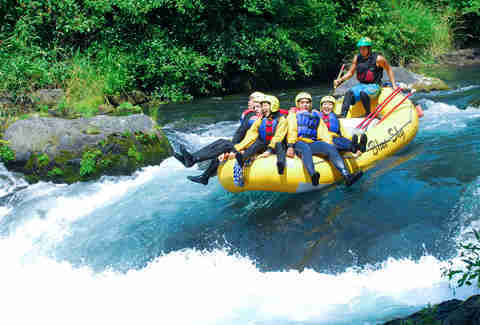 There’s a variety of rapids, from class two to class five; come here if you expect to progress in skill rapidly. Learn from the team at the Rocky Mountain Outdoor Center. Oregon-based kayaker Chris Korbulic is one of the best kayakers in the world. 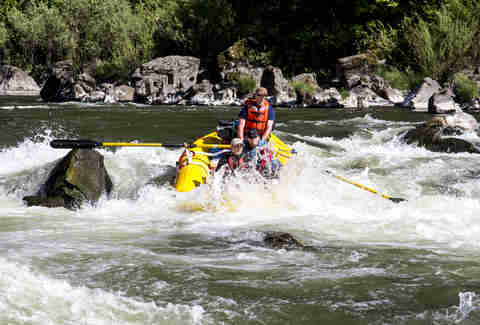 But the world-class athlete didnt just start by paddling off of 100-foot falls: Korbulic started on the Rogue. “It’s a great place to learn in the summer, and absolutely beautiful,” he says. “One of the biggest reasons to learn to paddle whitewater is how it makes wilderness and beautiful places accessible in a new and unique way.” Seeing the Cascade Range by water, while learning a new skill? Epic. Multi-day trips are offered by DeReimer Adventure. 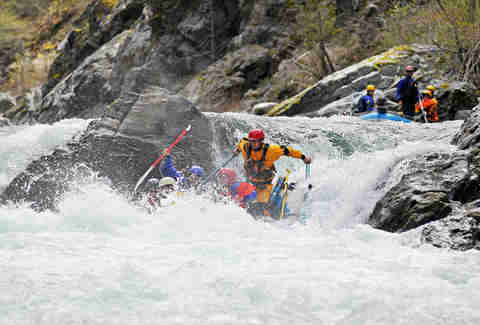 Korbulic also calls out California’s American River as one of the country’s best destinations for whitewater newbies. “It’s a great summer run with warmer water, and a very popular place to learn -- so it’s a great place to meet other novices and learn together. The paddling community is full of wonderful and unique people. Two towns, Lotus and Coloma, both along the American River -- are full of them. Take lessons from Current Adventures.